Kevin’s Opto-Key build environment has transferred from Synthfool to This Old Synth. 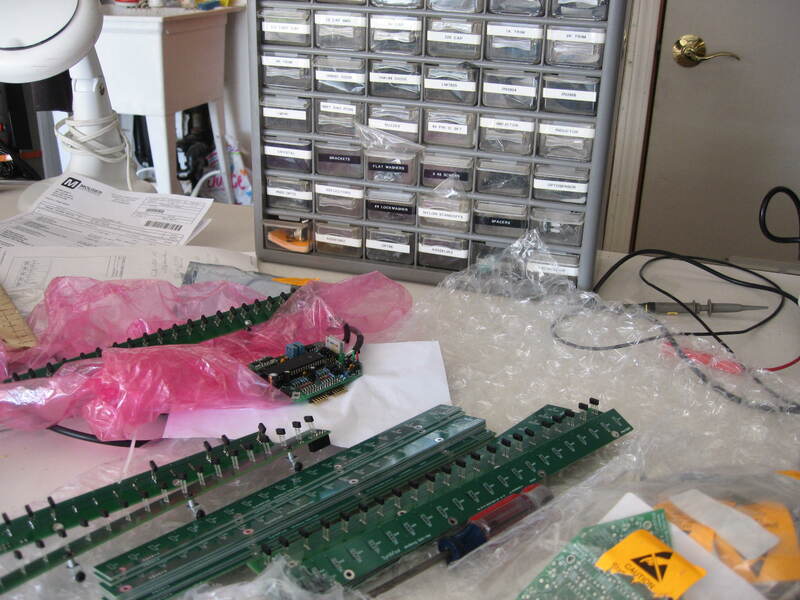 The components, software, circuit boards etc. arrived on Wednesday afternoon. Two days of work later I have partially completed 5 units. 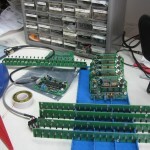 Time to get a components order submitted so I can complete them! 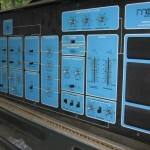 I did purchase the very last of unit built by Kevin and have begun testing using it in my MiniMoog; exciting times! 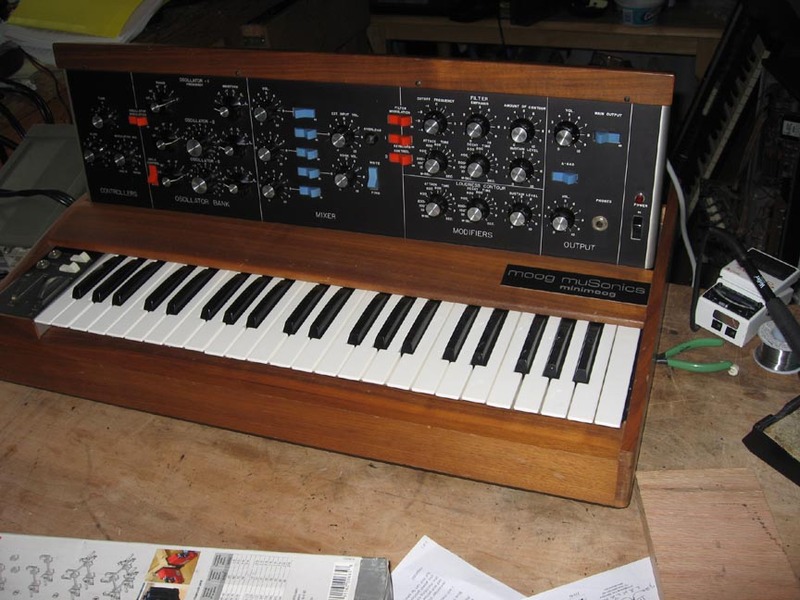 As a tech I’m increasingly frustrated with the chore of trying to restore the (oxidized) key contacts on the MiniMoog to full operation, and unless it is frequently played the issue of “squirelly keys” comes back. 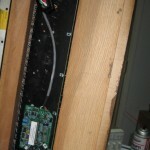 I have been installing Opto-key for my customers which removes the key cleaning cycle, AND adds simple note-on/off MIDI. 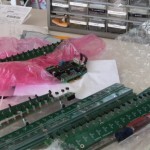 I was concerned and saddened to hear that Kevin Lightner at Synthfool could not continue the Opto-key project as it addresses the biggest reliability/playability issue with the MiniMoog, and have negotiated with him to transfer ownership here. Once the on-hand materials such as circuit cards arrive I will commence building the product to Kevin’s spec and make it available for sale. As I’m also a software developer with experience in embedded systems I plan to enhance and support Opto-key moving forward. I’m really excited by this! 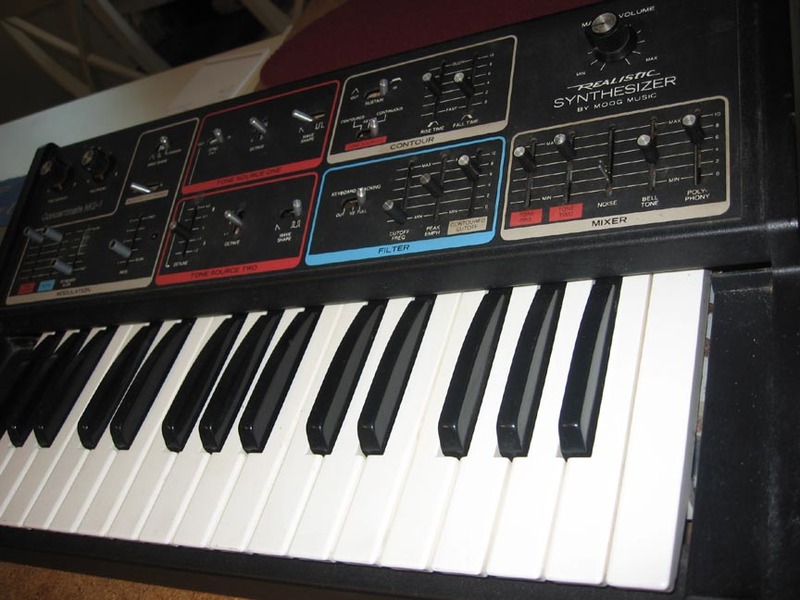 I’ve completed a few of these now, and must admit to a little trepidation when they come in as this synth was clearly made for education use (everything is squeezed into a plastic suitcase with no ventilation holes, or easy access to pre-sets for set-up etc.). Setting it up is difficult to say the least, and like others in blogs I have read, just got it to scale on both oscillators with minute adjustments. The original pre-sets are of very poor quality, so I replaced the majority of them; thy used very low ohm values and did not get a nice sweep on adjustment, so multi-turn replacements would be good, but space and access is an issue. The main issue was that it did not scale, and sounded like hell. 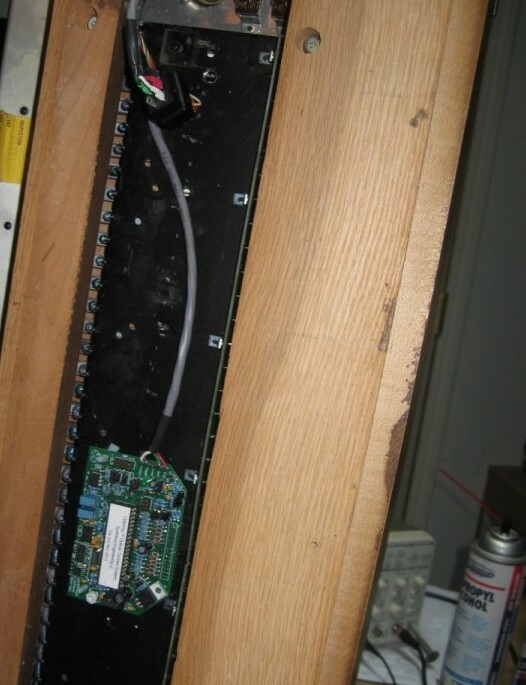 The root cause was the -15v regulator where the 723 regulator chip was holding it at -23v. Thankfully no other chips have died (yet) due to this. 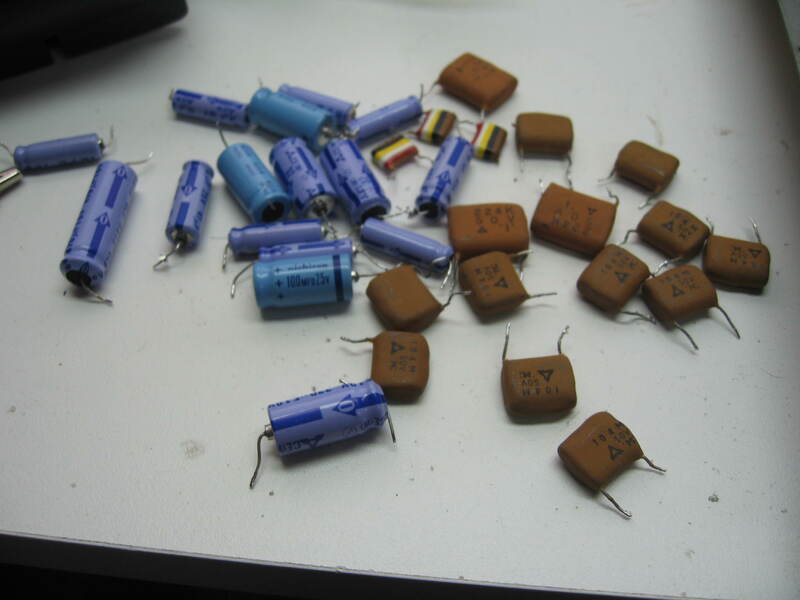 One of the rectifier diodes was also bad, so there was a lot of hum from that, but after replacement of these parts things settled down. 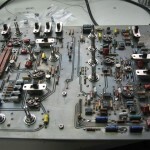 The Mullard C280 “Tropical Fish” caps were falling apart, so they were all replaced, alog with the can caps. 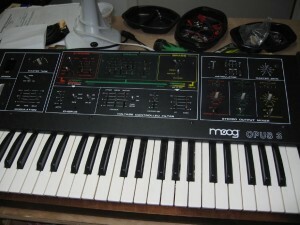 Next move was to service all of the pots/switches, re-bush the keyboard, and (struggle with the) set-up. Jim was delighted, which makes the effort worthwhile! Back on my favorite brand, Moog. There is a steady stream of MiniMoog’s through here, which is my overall specialization, but I do not report on them as it is mostly the same issues that strike them. This is a Multimoog, which customer Jim scored along with a Sonic Six. 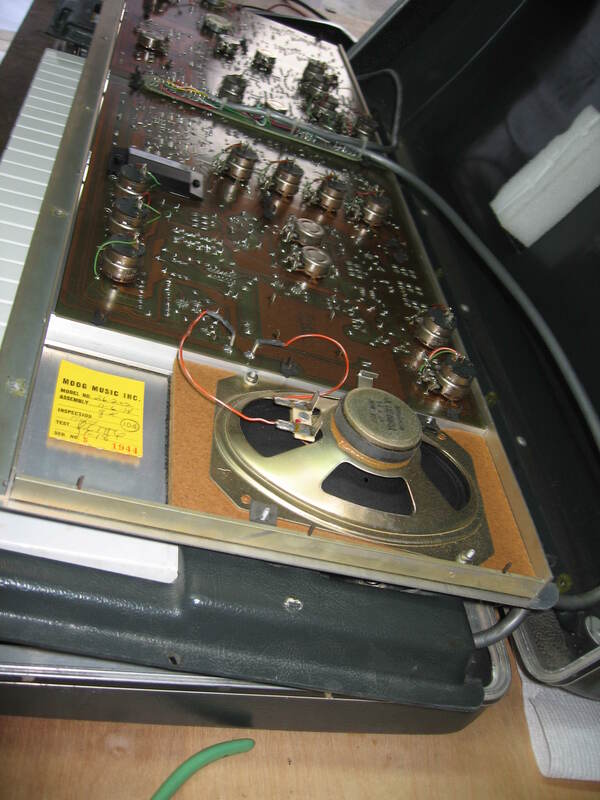 This one had no output, and the key bushings were shot; the seller reported that it worked when he put it it away in the closet decades before! 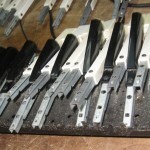 It cleaned up nicely, and the bushings were replaced with each key cleaned by hand. The buss-bar plastic mounts had gone brittle, so I had to make some parts on the lathe, and rob a parts keyboard to resolve this. 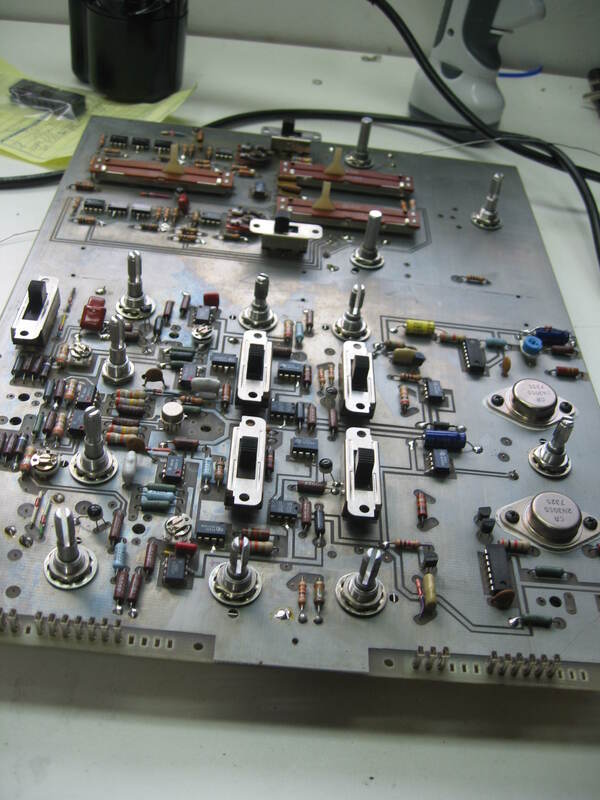 The lack of output was due to a dead CA3080E transconductance amp (common bug). 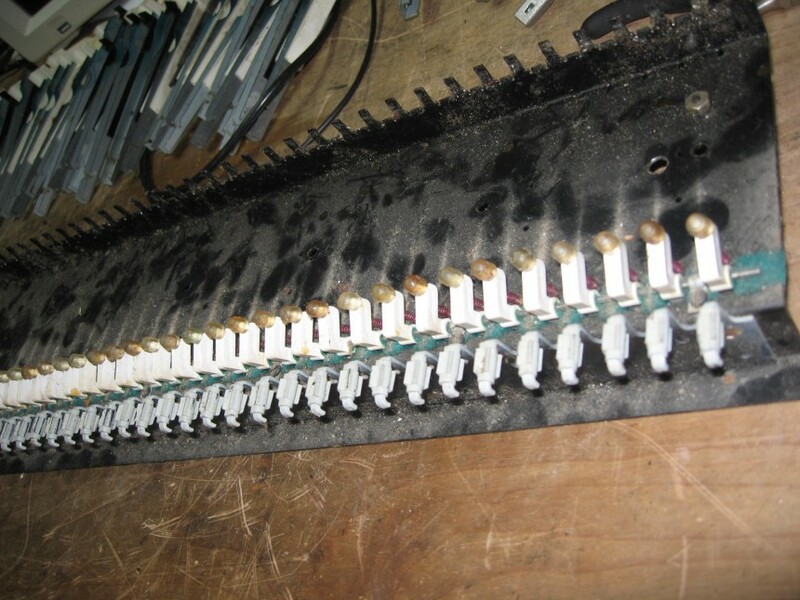 Pots and switches were gradually worked with switch cleaner until they performed correctly. 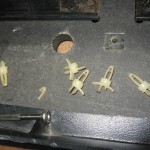 The buss-bars had to be removed in order to get the oxidization off them and the contacts. Unit was set up and played nicely. One surprise for me was that the after-touch was fully working, pity the design of this severely limits key travel. 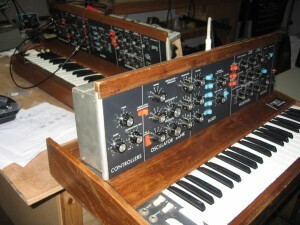 The MiniMoog, along with many vintage synths, suffers from oxidization of the key contacts. 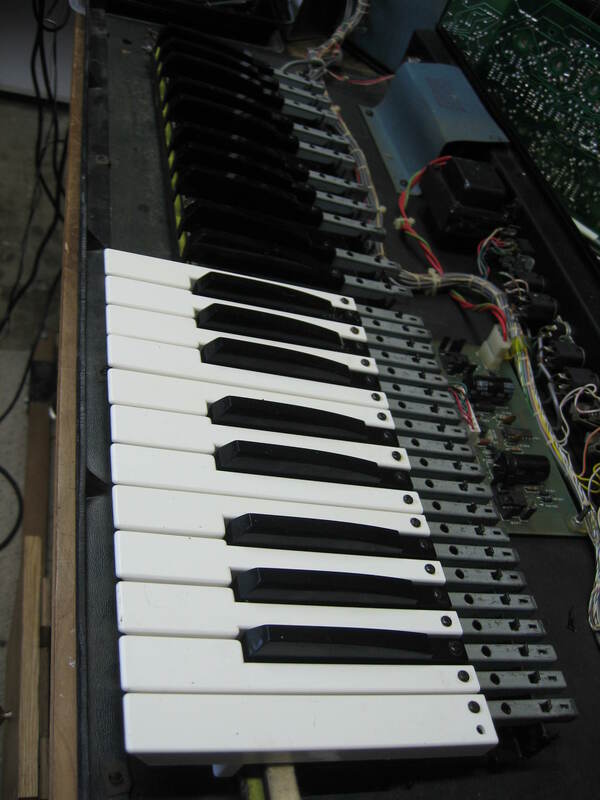 It needs all keys to be pressed regularly to break the building oxidization, before it becomes a problem. The symptoms of the keys going bad are they become “squirelly”, i.e. multi-triggering, or dead due to not triggering at all. Another issue you see on keyboards is that as the keyboard generates CV from a resistance chain (1volt/Octave being common), any resistance in the contact alters the voltage out, thus frequency. 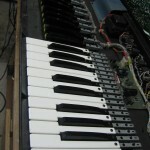 The folks at www.synthfool.com came up with an optical method of detecting key presses, called the Opto-Key. 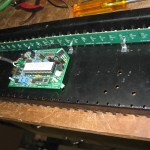 This incorporates a micro-controller in the design, making it possible for them to also add MIDI In/Out. 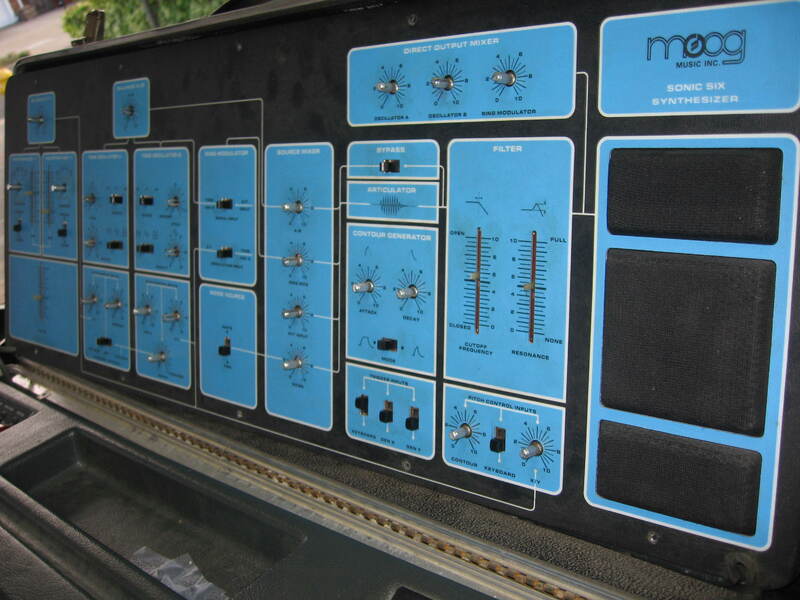 Jason, the owner of this early MiniMoog, decided that as it was in need of service, he would ask me to implement Opto-Key, rather than continue with the key contact clean regime. The keyboard was re-bushed while disassembled for the upgrade, and I can report that it works nicely. A service was also carried out, and some pots had to be opened in order to clean them and banish crackles. 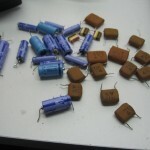 For reliability the disintegrating C280 “Tropical Fish” capacitors were replaced, the power supply re-capped, re-greased, and bridge rectifier replaced. All switches and open-back pots were cleaned, and the unit set to spec. Plays nicely now. 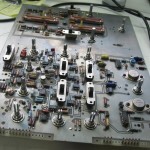 This early unit (#242) needed some further work after another tech had worked on it. 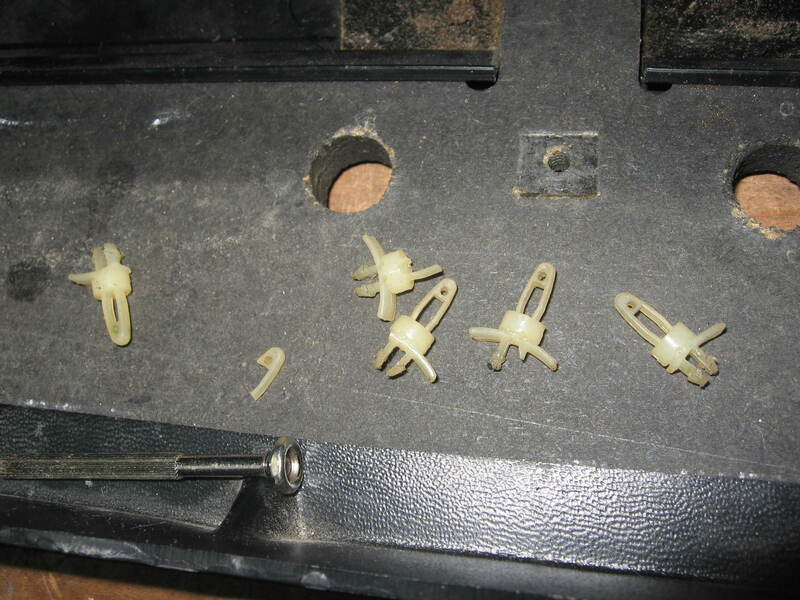 The keyboard had been re-bushed, but the bushing supports had not been straightened, which coupled with some badly stretched key return springs had left it unplayable. This was resolved, and once the set-up was completed (it had been tuned from C on the far left when in fact the first key is an F!) 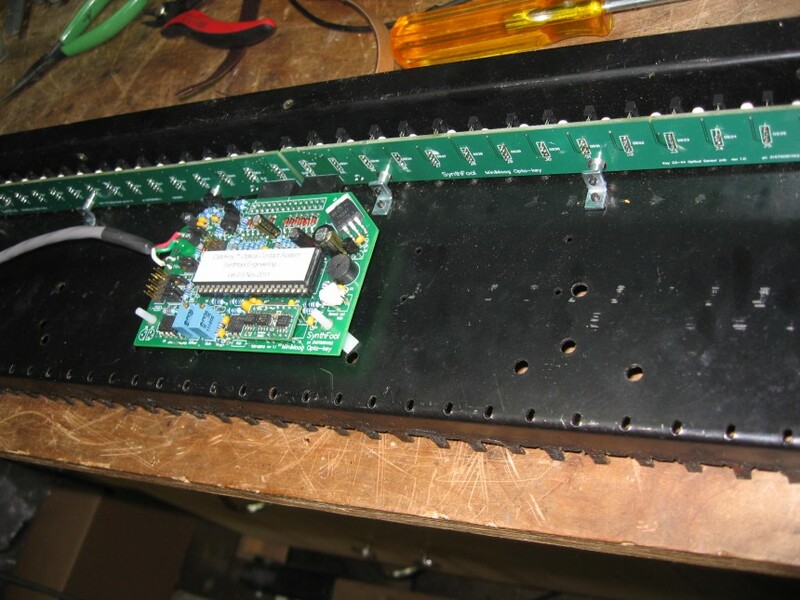 it played great (taking into account the temperature drift you get on a version 1 oscillator card!). 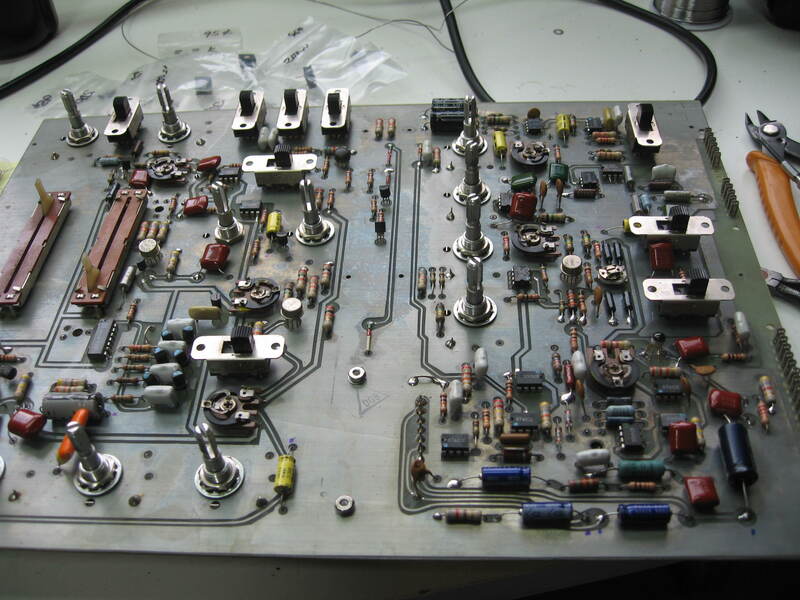 via This Old Synth – Vintage Analog Synthesizer Repair Portfolio Page. A second unit came in with a severe case of deteriorated foam having ruined all of the sliders and switches, along with other issues. 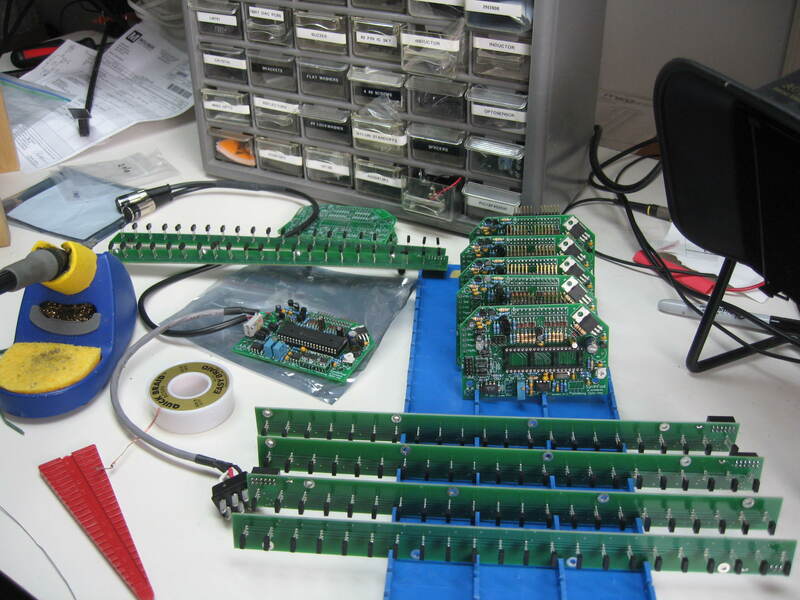 A deep clean was performed, all sliders and switches removed, board washed, and then re-populated. The other issues could then be isolated and repaired. I believe the foam is getting conductive and destroys chips, especially the CA3080E; best not to power it on when you find one with the foam issue and to get it cleaned up first. 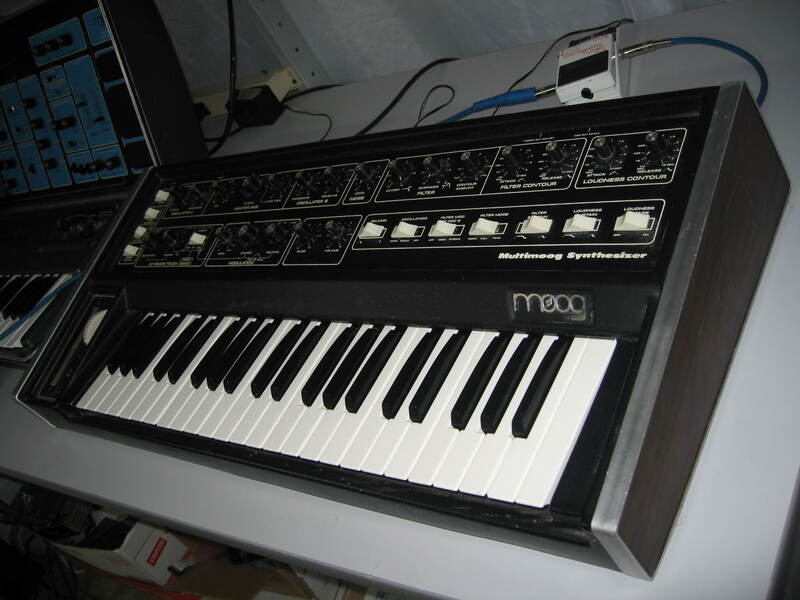 Restoring this mini synth was a long process as the electronics in it is highly interactive and tends to mask the root cause. 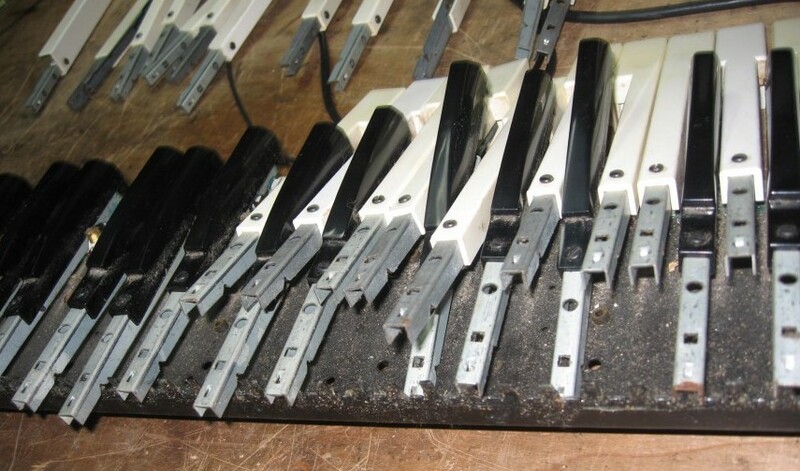 A previous repairer had replaced all of the sliders and switches, along with cleaning all of the goo from the control panel where the original foam had deteriorated. 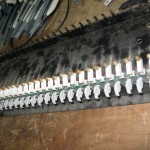 The switches and sliders still needed vast amounts of switch cleaner to get them crackle free. Cleaned the keyboard contacts also. The symptoms were then a thin sound, crackles, and the contour was misbehaving. 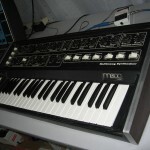 A mod had been wrongly applied which injected earlier audio onto the volume control Moog MG-1 Keyboard and second circuit board rather than aux-in; removed this mod. 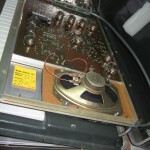 Transistor Q28 which is associated with the audio out (LM3080) was causing the crackling and very low sound from cold. 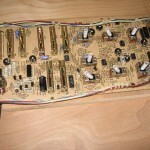 The contour issue was the LM741 (U8) which is a summing amp. 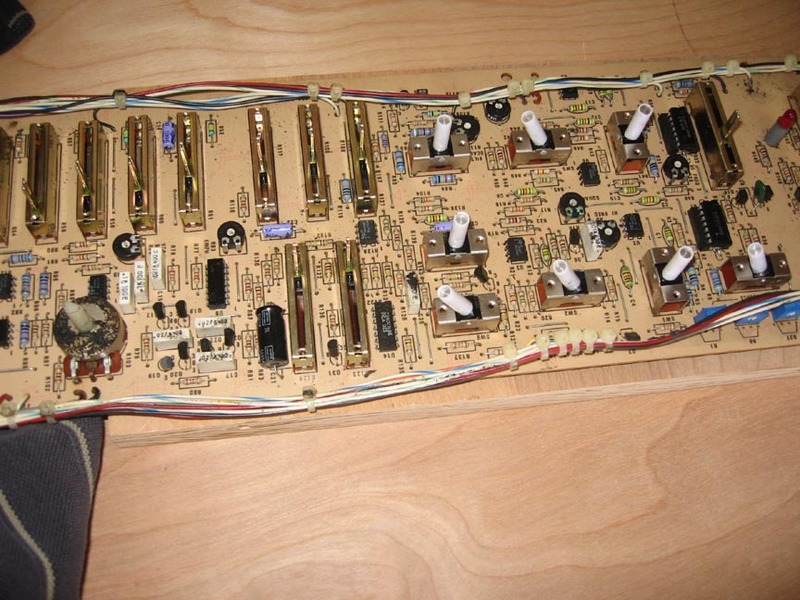 Thankfully Anchor Electronics had some of these obsolete LM741’s.